Hey everyone, thanks for all your awesome work! As in the title: I get these lines in the city ground textures. 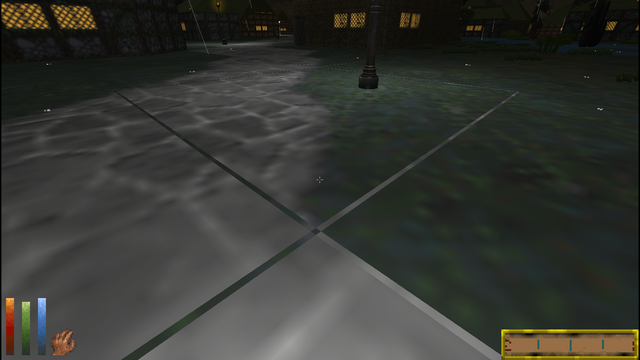 They make the ground texture beneath it visible in thin lines so I can see for example water under a path. mip mapping issue, may be related to gpu drivers. I'd like to try and solve this issue as well and gather more information about it. I don't know what the OP is using for GPU, but I am using Intel Integrated HD530 with the latest graphics drivers on Windows 10. They've always been there for me in this program, and only this program. Should I file a bug report to Unity or Intel? What API is DFUnity using? I'm assuming it's OpenGL? Is there any way to change it to Direct3d and see if that clears it up? Minimum GPU spec for Daggerfall Unity is roughly a GeForce 660 from 2012. Adding even a 6 year old GPU like the 660 will still perform over 2x better than the iGPU on a modern i7-8700k Coffee Lake processor. There will be other benefits as well like much higher fill rate and lighting performance. But that's not to say the terrain texturing shader couldn't be improved and these problems fixed for low-spec rigs. I'm no shader expert, and fix might even be relatively simple. If someone takes a look and resolves it, send me a PR and I'd be happy to take a look. If you're wondering why I don't use a discrete, it's because I have a silent mini-itx build with a 130w dc power brick. I don't do a lot of pc gaming, mostly emulators and dota. If I were to get a discrete card, it would be a 30watt nvidia gt1030. So there's no way to use Direct3D or Vulkan? It's possible that this is Intel graphics driver related like the floor grids, so I'm posting it here. There is a vertical line 1 pixel wide that if I place my crosshair on it, the sky texture disappears. Save below. If everyone else gets it, feel free to move this to the bugs section. The ground seam's not an Intel issue. I was getting the same issue on a GTX460 (I know, below spec, but it ran). I was also getting seams along the edges of stairs in dungeons and some seams in walls. Also quite a few 3d objects appeared to be floating just above the ground, although it might be an issue with shadows rather than object placement. I just chalked it up to one of the mods I installed. Just got a radeon RX570 a few days ago. Aside from loading DFUnity briefly to see what kind of fps difference I got, I didn't play with it until this new release. Immediately rushed to try out the new smaller dungeons and it appears that the seams are gone. Not sure if it's the new card or the new version of DFUnity. Still have the seams on the ground and the floating objects, though. Last edited by chantling on Tue Jan 22, 2019 4:46 am, edited 1 time in total.